London South Bank University (LSBU) holds annual Graduation Ceremonies in the autumn of each year, at the Royal Festival Hall which is part of the Southbank Centre, London. The School of Business holds two graduation ceremonies (PDF File 116 KB) taking place at either 11am or 3pm on Monday 29 October 2018. Each ceremony is 'invite only' to eligible graduates. All School of Business eligible graduates will be emailed their invitation by the beginning of September 2018. 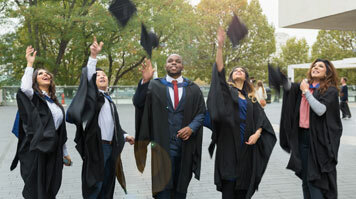 Graduates must book their LSBU graduation ticket via the link from their email invitation. If you are a graduate and did not receive your invitation book your place now. Graduates: please register only once. Once registered, graduates receive a confirmation email with details on how to book guest tickets, arrange robe hire, photography, DVDs and graduation merchandise. PLEASE NOTE: If you do not register for your graduation, your name will not appear in the graduation programme. Each graduate can purchase up to six guest tickets each. (The Royal Festival Hall Box Office can be contacted on 020 3879 9555). Gown hire must be ordered up to 21 days prior to graduations and it is recommended that graduates pre-order photography in advance. Please note: graduates are asked to arrive at the ceremony venue up to 90 minutes before the start of their ceremony to ensure they have enough time to collect their gown, get their photographs taken and to collect their graduate ticket from the LSBU Registration Desk. Although official photography is available after the ceremony, it is advised that graduates and their families get their photographs taken beforehand. Guests and graduates must take their seat in the auditorium at least 30 minutes before the ceremony starts. After the graduation ceremony concludes, there is a reception which takes place in the venue on Level 4 Green and Level 4 Blue Sides, and Level 5 which lasts approximately one hour.